A perfect class for anyone looking for a quick and fun project! 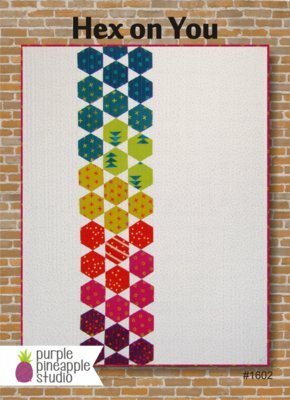 This month we will be using Purple Pineapple Studio's Hex on You pattern (included with your class fee). The class focuses on accurate cutting, achieving a consistent 1/4 inch seam, and the flip & flops of pressing. Bring along your walking foot and we'll get the quilting started before class ends! If you would like help selecting fabrics we are happy to help! Come by the store and we'll get you all set up! Our guest teachers reserve the right to cancel 48 hours prior to any class if the class participation level is below any stated minimum.